When I was photographing meerkats (Suricata suricatta) in Botswana, I wanted to create a shot that I had never seen before of these little critters - a silhouetted meerkat against a great ball of fire, the setting sun. I had no idea it was going to be such a challenge. To get the shot, the conditions needed to be just right - a clear day with a lot of wind so that there was a lot of dust in the air. Without dust the sun would never turn yellow and red. 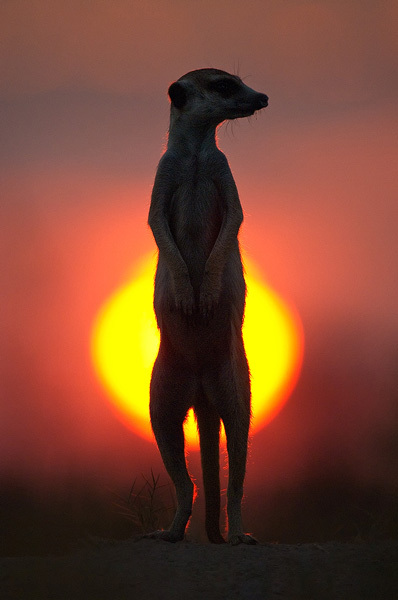 More importantly, I needed to get a single meerkat between me and the setting sun. Did I already mention meerkats run a lot? It took me a few days to finally get the shot.